You'll look awesome getting out of any of these cars. Many people believe that cool car doors are the exclusive domain of the supercar. The only way to have doors that open up like a spaceship is to spend hundreds of thousands of dollars on a Lamborghini, Ferrari or Koenigsegg. In fact, there are a wealth of affordable production cars with unique doors that open in strange ways. We have chosen five, all of which are non-supercars and can be purchased with a reasonable amount of money. US residents may be looking at our first choice and wondering which European automaker would build such an interesting looking car. To many people's surprise, this car is actually a Toyota. The Toyota Sera was a 2+2 hatchback coupe that was sold from 1990 to 1996 only in the Japanese market. This car wasn't exactly fast, with a 1.5-liter four-cylinder sending power to the front wheels. The Sera was available with a four-speed automatic or a five-speed manual, but the interesting part of this car was its butterfly doors. Gordon Murray even cited the Sera as the inspiration for the doors on the legendary McLaren F1, which is pretty high praise. The next car on our list doesn't actually have doors, but simply a single door. The BMW Isetta was known as a bubble car. These were popular in Europe during the 1950s because they were cheap and only required a motorcycle license to drive. The original car only had a 236 cc 9.5 horsepower motorcycle engine, which was later increased to 300 cc. Two people could sit in the car, but there wasn't much room for storage. The only way to get into the car was a front-mounted door that cleverly kept the steering wheel and pedals in place. Getting out of one of these would certainly stir up attention at a car show, though maybe not solely because of the unique door. Gullwing doors (also known as falcon-wing doors) originated with the Mercedes 300SL. The DeLorean DMC-12 was the car that really launched these doors into popularity thanks to the Back to the Future franchise. We wanted to mention the DeLorean on this list, but the car that we have included is the Japan-only Autozam AZ-1. The AZ-1 was a small, mid-engined Kei car that was sold in Japan from 1992 to 1994. The car was designed by Suzuki, but sold under Mazda's Autozam brand. The AZ-1 was powered by a 657 cc three-cylinder turbocharged engine with 64 horsepower going out to RWD. It may not be fast, but it is incredibly fun to drive. Suicide doors, or as Rolls-Royce likes to call them "coach doors," were popular on vintage cars and horse drawn carriages many years ago. Today, these doors are less popular because of safety concerns with people being able to open them at high speed. Rear suicide doors are most commonly seen today on pickup trucks, but Mazda did use them on its sports car, the RX-8. 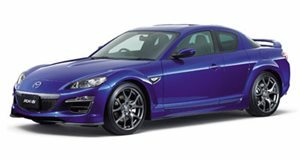 The RX-8 was sold from 2003 to 2012 and had many issues with reliability and recalls during its life. Instead of just having two doors, Mazda gave the RX-8 rear-hinged suicide doors that made it easier to get into the back seats. The Renault Twizy is the only car on this list to have doors as an optional extra. The Twizy is a small electric car that has two seats in tandem. The doors on the car are vertical (like a Lamborghini) and allow passengers to get in from either side of the car. It's possible to order this car without any doors, but the optional doors with windows cost around $800 and offer protection from wind and rain that a motorcycle can't. This car may look a bit silly, but it does have some very unique doors.